Graphic from Figure 5 in Contractor Report - Vertical Derivative Grids before (Conventional Grid - left) and after (SI-Grid right). On July 19, 2017 the Department of Natural Resources released via Open-File format several files resulting from a pilot project to test whether legacy statewide aeromagnetic data products might be improved by additional reprocessing and re-gridding of the underlying data. 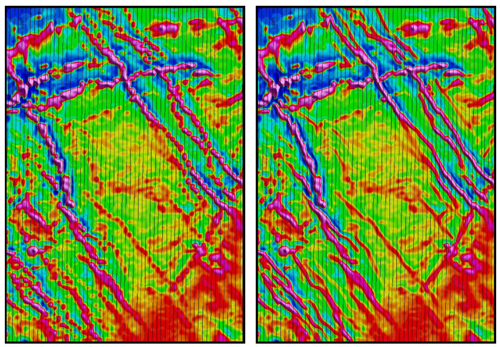 Minnesota's existing statewide aeromagnetic data coverage and derived products provide geoscientists with a valuable remote sensing aid for interpreting bedrock geology in areas of the state covered by surficial materials. The new pilot project data files are being released so that users of aeromagnetic data may gain access to the project files prior to development of a final report. The Department invites aeromagnetic data users to review, compare and provide feedback on the reprocessed data, gridded products and optional derived products, and whether similar reprocessing of other legacy data blocks might be beneficial.